Posted byadmin	 August 26, 2014 May 20, 2015 Leave a comment on Identicode now released … and updated! 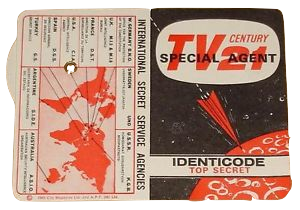 I recently released my latest app which is the app equivalent of the ‘Identicode” blue/red code translator in the TV Century 21 Magazine. Not only that but I forgot to post the launch and now I’m sending an update to Apple already! I was a big fan of Thunderbirds as a kid (and as an adult too!). Not only that but always watched the puppet shows Captain Scarlet, Joe90 and later the live action UFO and Space 1999 too. Gerry Anderson seemed to understand just what some of us kids loved – SciFi, spies, fantastic technical wizardry, evil baddies, secret agents, clever machinery, fun stories and great characters. The quality of all those shows has endured to this day. I never had one myself as a kid and I had a look on eBay only to find that there was one for sale for £900 and another had just been bought for £78! Phew! I couldn’t send off my 1/- but being an iOS developer I thought I’d write one for my own use and for any other fans out there who couldn’t or wouldn’t pay for one on eBay assuming that there was still one there to buy. The result is the Identicode app which does everything that the original card and paper one did and a bit more. You can copy and paste, it flips between blue and red codes, it encodes and decodes and makes some fun sounds too!